How often do you walk into the movie theater and pay a pretty penny for you and your family to see a cinematic adventure when you know exactly how the movie is going to end? Well, if you’re like me and the throngs of movie-goers that eagerly plodded in to watch “Captain Phillips”, that’s exactly what you did. Just sit right back and you’ll hear a tale, a tale of a fateful trip… no wait… that was “Gilligan’s Island”. 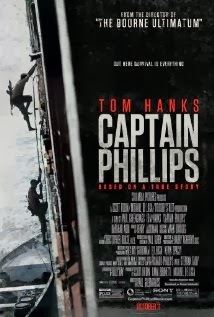 “Captain Phillips” is the film adaptation of the true story of Captain Richard Phillips, who was the skipper of the Maersk Alabama. Phillips, wonderfully portrayed by Tom Hanks, is a normal guy that lives in Vermont who simply wants to do his job and go home. He’s relatively new to the ship’s crew, so there’s not much of a working relationship. After a short time out to sea, he learns of pirate activity off the Somalian coast, so they run drills, only to have the drills turn into the “real-deal”. The Somalian pirates are an interesting group. Initially, there are two boats that attempt to hijack the Alabama, but when Phillips and his crew outsmart them, only one returns. When it does, it returns with the more ruthless and “intelligent” (using that word loosely) Abduwali Muse (played by newcomer Barkhad Abdi) who is the leader of the pirates and declares himself the “captain”. After a game of cat and mouse between the crew and the pirates on the ship, it becomes evident that there is no way the pirates can actually take over the massive cargo ship. Instead, they take Phillips and escape on a lifeboat. The rest, shall we say is history. The Navy SEALs show up and do what they do best. Shoot bad guys in the head. I enjoyed this movie tremendously. I can’t remember the last time that I walked into a movie knowing what was going to happen in the end, yet still was captivated and on the edge of my seat wanting to know the exacts of how it was all going to go down. The flow of the movie was good, and it seemed to move along pretty well for the two-plus hours. I found that it only lagged for a short time during the lifeboat scene. The only part of the movie that I really found fault with was the final scene when Phillips was being checked out by medical on the Navy ship. Maybe it’s just Jeff being picky because I was a medic in the Army for a hundred years, but I’d like to think that they would’ve had an actual doctor looking at Phillips and not just a Navy Corpsman. As for the PG-13 rating? Warranted. I would let my teenager watch this movie without hesitation, as the only terrible scene was when the SEALs were doing what SEALs do best. As for allowing a 9-year-old kid to watch the movie? Probably not the best idea. I hear “Cloudy with a Chance of Meatballs” is great and is still playing.